In a previous post on James Pimm, we saw that Pimm’s successor at 3 Poultry was one Samuel D. Morey who, according to his 1877 probate listing, could also be found at 201 Bishopsgate. We have to go back to the end of the eighteenth century to sort out the Moreys at Bishopsgate. In 1796, Harry (or Henry) Edward, the son of Harry (or Henry) Morey became apprenticed to Samuel Dance, a Butcher, that is, a member of the Company of Butchers, but, as we shall see, not necessarily a butcher in the sense of someone dealing in meat. An insurance record of 1788 saw Samuel Dance at 194 White Cross Street, but by 1793, he had moved to 189 Bishopsgate. Harry Morey is described as a patten-maker of White Cross Street, so young Henry Edward went to work with a former neighbour. 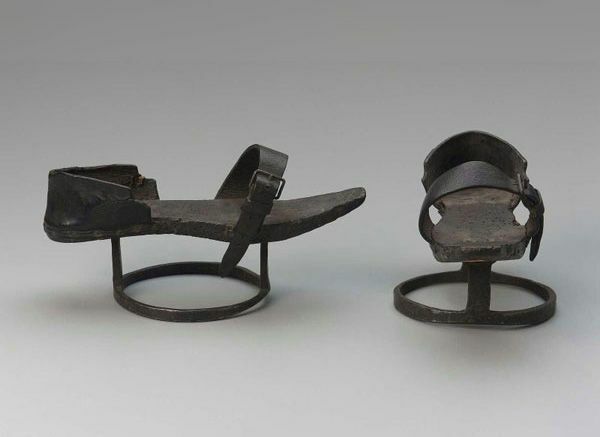 A patten-maker, by the way, is someone who made wooden overshoes that protected the wearer’s shoes from the mud on the streets. For pictures of people wearing pattens see this blog post by the Georgian Gentleman. 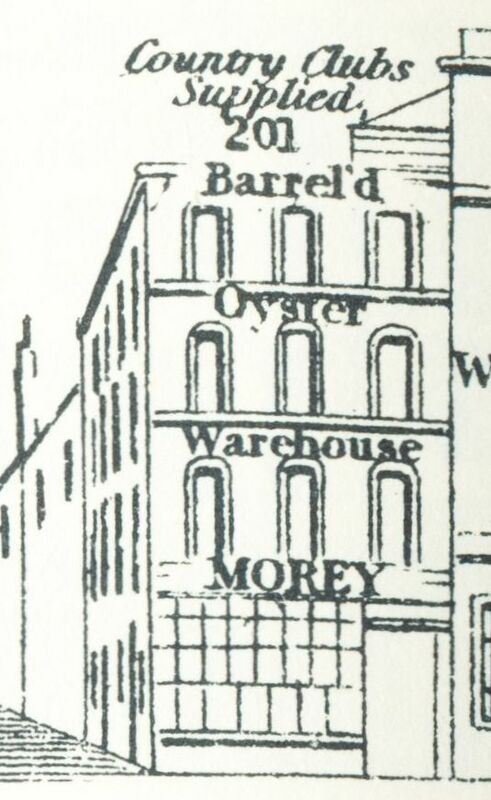 Somewhere between 1803 and 1806, Harry Morey also moved to Bishopsgate, but not yet to number 201. 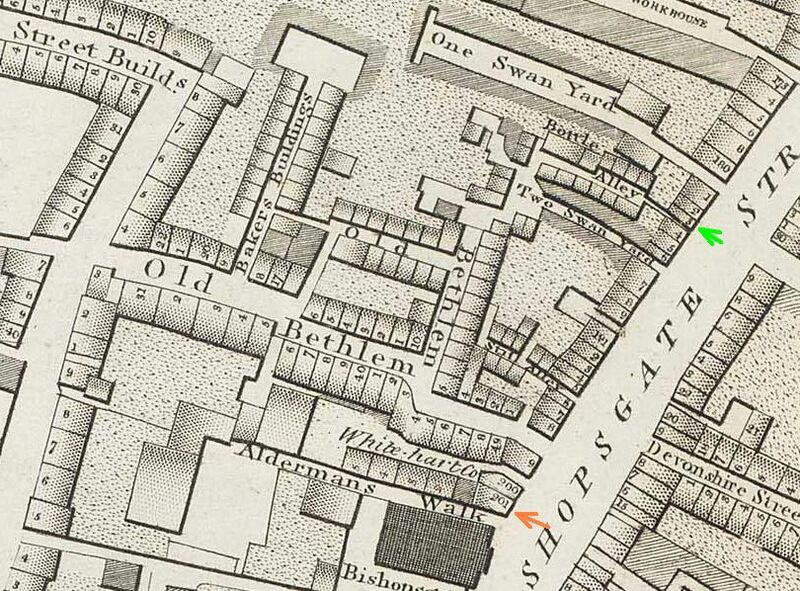 The 1806 tax records find him in a house between Bottle Alley (renamed Britannia Place) and One Swan Yard, number 183 or 184. 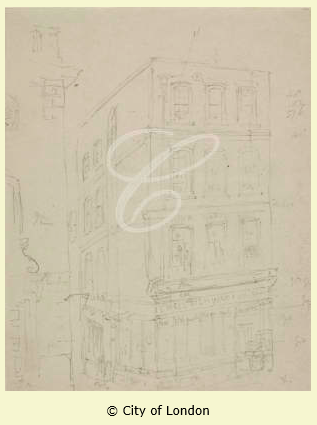 (1) Morey hung on to his property in White Cross Street, although in his will of 1818, he describes himself as of Bishopsgate Street, so presumably that became his main residence. (2) His widow Susanna remained at number 183 and even after her death in 1824, the tax records still list her name, suggesting that the property remained in the hands of the family. Only in 1840 do the records list a new proprietor. Susanna was the sole executrix and beneficiary of Harry’s will, but had left the estate of her husband unadministered and when she died in 1824, her son Harry Edward had to sort it out. In the documents, he is described as the only child of the deceased and of 96 White Cross Street. He moved his business to 201 Bishopsgate Street sometime before 1829 as he is then listed at that address in the Sun Fire Office records as dealer in pattens and shell fish. Perhaps an unlikely combination, but patten-making had been the trade of his father and he was himself listed as such in the baptism records of his children, but fishmongering became his occupation in Bishopsgate, specialising in shell fish as the elevation in Tallis’s Street View testified where the business is described on the front as ‘Barrel’d oyster warehouse’. 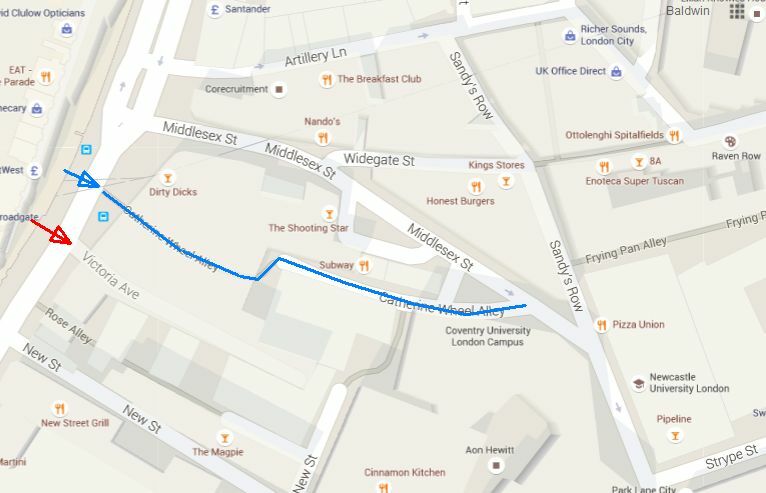 Number 201 was situated between The White Hart tavern and St. Botolph Bishopsgate Church. 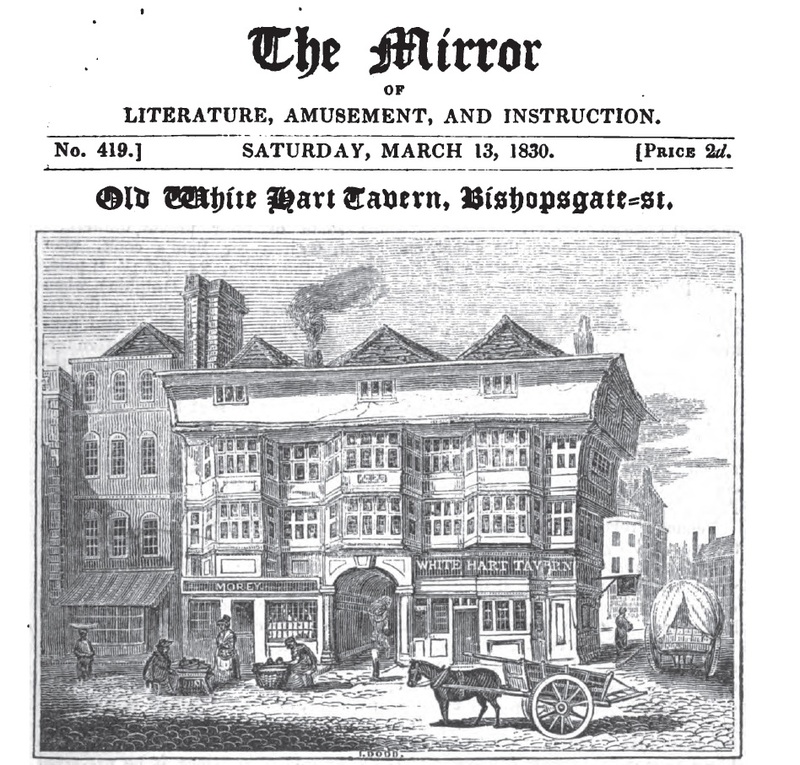 Another picture of the tavern in The Mirror of 1830 (see the post on The White Hart) shows Morey’s name on the left-hand side of the inn building, but that must be a mistake by the draughtsman, as there is no evidence to suggest that Morey occupied part of the White Hart building. In the 1825 picture above the name of Kempster can be seen on that part of the building and as other pictures also show Kempster’s name, and so do the tax records, that name must be correct. Morey had always occupied the building next to the White Hart, number 201, and we see him there in the 1841 census as a fishmonger. Also living there is son Samuel with the same occupation as his father and another son Robert who is a butcher. Henry Edward died in 1855 and left his estate to his four sons, Henry Trott, Samuel Dance, David Edmund and Robert Borkwood. Judging by Samuel’s second name, I think we can assume that the former master of Henry Edward was his godfather. When Samuel Dance, Morey’s master that is, wrote his will in 1813, Henry Edward was one of the witnesses and one William Trott the other. (3) Did he become Henry Edward’s eldest son’s godfather? Possibly. I have not found a marriage for Henry Edward, so we do not know more than a first name, Catherine, for his wife, and can hence say nothing about her last name; it may have been Trott. According to the records of the Sun Fire Office, Henry Trott could be found at 418 Oxford Street in 1831 as a fishmonger. He was the first of the brothers to die, in 1868, at St. Agnes Terrace. (4) The Sun Fire Office records also tell us that Robert Borkwood became a butcher and insured a property at 4 Hatton Wall, Hatton Garden in 1839. 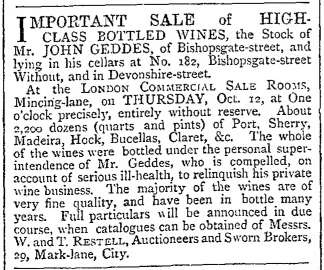 David Edmund took over the running of the 201 Bishopsgate shop and Samuel Dance, as we saw in the post on James Pimm, became the proprietor of 3 Poultry and may or may not have had something to do with the invention of Pimm’s No. 1 Cup, although the fact that it was his property that continued the Pimm’s name for the establishment rather that of James Pimm himself is perhaps telling. Samuel Dance Morey died in 1877 and is described in his probate record as formerly of 201 Bishopsgate and 3 Poultry, but late of 11 Northampton Park, Canonbury, gentleman. (5) He may have retired in 1865, or just concentrated on the Bishopsgate shop as in that year the licence for Pimm’s in the Poultry was transferred to Frederick Sawyer of the Green Man, Bucklersbury. (6) The premises were extended to include numbers 4 and 5 Poultry and at the back also numbers 5 and 6 Bucklersbury. It is hard to say without further research whether Morey had already set this extension in motion, or whether Sawyer was solely responsible, but it was Sawyer who negotiated a new lease in 1870 and who commissioned an architect to build a new restaurant at 4-5 Poultry (see the postscript to Pimm’s post for more information and a picture). 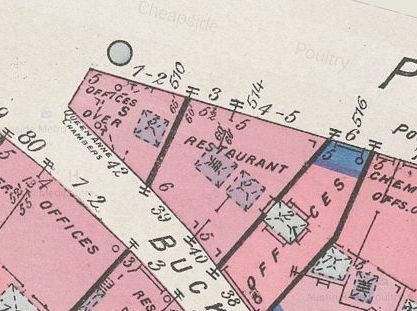 It is a fact that the 1886 Goad insurance map shows the 5 houses as one large ‘restaurant’. 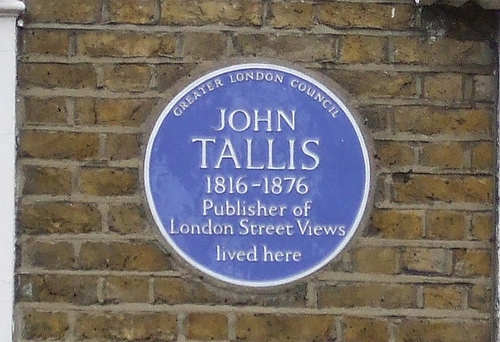 (1) Horwood gives the property number 183, but Tallis has the same property as number 184. In his Street View, number 183 does not exist. (4) England & Wales, National Probate Calendar (Index of Wills and Administrations), 1868. Effects valued at under £4,000. (5) England & Wales, National Probate Calendar (Index of Wills and Administrations), 1877. Effects valued at under £80,000. (6) The Era, 8 January 1865. (7) England & Wales, National Probate Calendar (Index of Wills and Administrations), 1889. Effects valued at well over £28,000. His brother Robert Borkwood of 8 Chart Street, Hoxton, is named the executor. (8) England & Wales, National Probate Calendar (Index of Wills and Administrations), 1892. Effects valued at over £11,000. 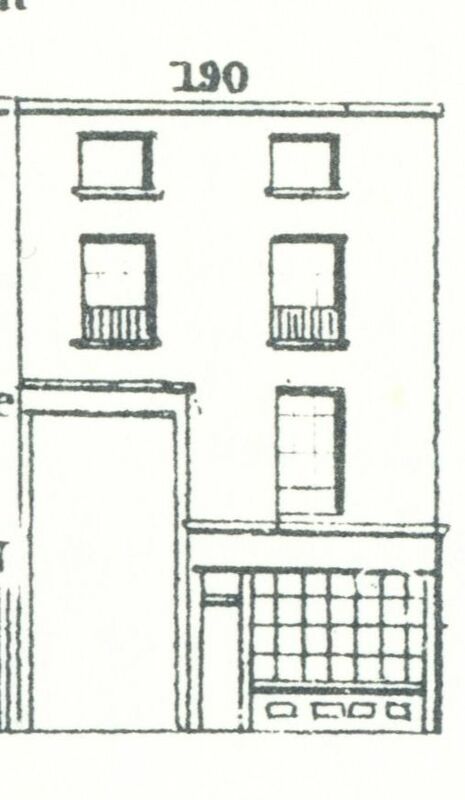 Mr. Whitfield at number 38 had, according to the writing on the elevation in Tallis’s Street View, a business in “carpet & floor cloth wholesale retail & for exportation”. The 1841 census identifies him as John Whitfield, warehouseman, 35 years old, and his wife Eliza, 40 years old, but his real name was Jeremiah Whitfield as Pigot’s Directory of 1839 correctly states. At one point, I thought Jeremiah might be related to John Whitfield, cheesemonger of Lamb’s Conduit Street, and William Whitfield of 44 Old Bond Street, but that does not seem to be the case. Jeremiah obtained his freedom from the City of London in March 1838 by redemption, indicating that he had not gone through the usual apprenticeship of 7 years. In the papers deposited at Guildhall, there is a document listing Jeremiah’s age as 35 and his father’s name as Ralph Whitfield, late of Barton Bendish, Norfolk, labourer, deceased. Barton Bendish is fortunately a very small village and it was easy enough to work out that Jeremiah was baptised on the 9th of May 1802 as the son of Ralph and Sarah. Ralph died in 1825 at the age of 47. As Jeremiah was not apprenticed to a member of one of the London Companies, there is no information as to when he came to London. Kent’s Directory of 1823 does not list a Jeremiah Whitfield anywhere, but he may of course have been employed rather than have owned a business. He was definitely not yet the proprietor of 38 Bishopsgate as one William Hare is listed there as carpet and rug manufacturer. There is a marriage listed in February 1825 at St. Leonard Foster Lane with Elizabeth Proud, which may very well have been the Jeremiah and Elizabeth of number 38, but there is no conclusive evidence that this is indeed the case. In Pigot’s 1825-26 Directory, William Hare is still the proprietor of number 38 and Whitfield is still nowhere to be found. 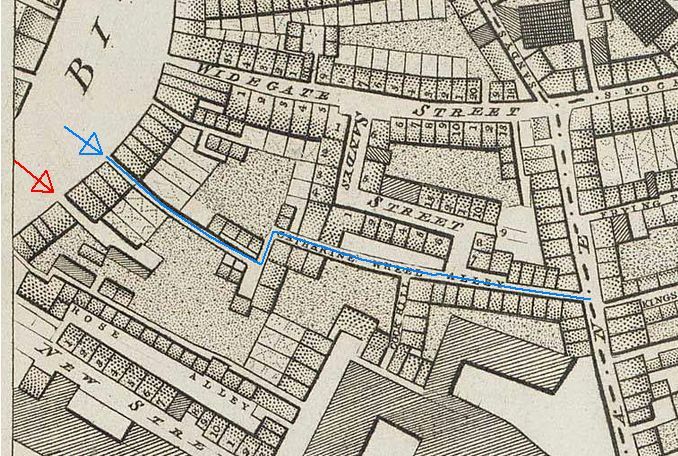 Jeremiah must have started his carpet warehouse somewhere between 1826 and 1838 as a set of watercolour elevations of Bishopsgate Street of that latter year show his name to the right of the cobbled alley leading to the back of the buildings in that section of the street. 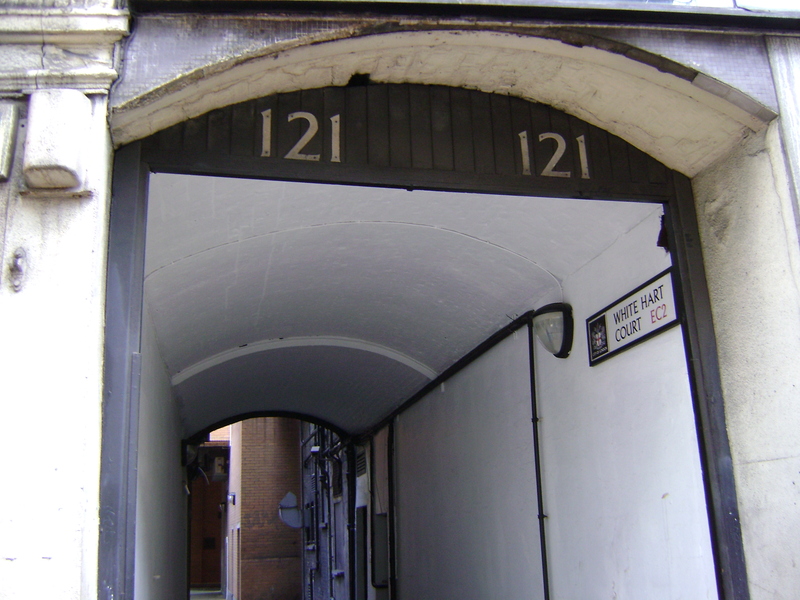 The anonymous artist has given the alleyway a rounded ceiling, although Tallis has levelled the top of the arch and shows two doors on the right-hand side rather than the one shown in the watercolour. Whitfield must have occupied the premises above the alleyway as the house numbering does not correspond to the Tallis directory in any other way. Reynolds, milliner, occupies number 39, then comes Whitfield at number 38, then Mrs Hammond, dressmaker at number 37 and number 36 is the Coffee Rooms, in Tallis occupied by Shrimpton, but in 1838 by Robert Field. Whitfield’s carpet business was not a great success and in April 1841, he is declared bankrupt. He is allowed to continue trading and is awarded a certificate in February 1843. (1) Later that year, a wine merchant by the name of Edward Jenner Stannard comes to the Whitfield warehouse and wants to buy a floorcloth and two mats for his counting house. They were to be paid for on delivery. The porter sent with the mats was not to deliver them without receiving the money. Stannard did not show up at the appointed time and the porter brought the material back. Stannard called again the next day and increased the order to 25 pieces with a total value of £150. Whitfield stated that he would only accept ready money as the profit margin on the mats was very small. The goods were transported in two vans and the porter was sent with the second one to receive the money. However, the mats were not brought to Stannard’s home or warehouse, but to a Mr. Davis in St. Mary Axe. The porter was not given the money, but was told Stannard would come to Whitfield the next morning. He did indeed come the next day, but only offered bills and no cash. Whitfield refused. After a bit of toing and froing, Whitfield tried to get his carpets back from Mr. Davis, but he would not let them go as he had a claim on Stannard which was covered by the carpets. 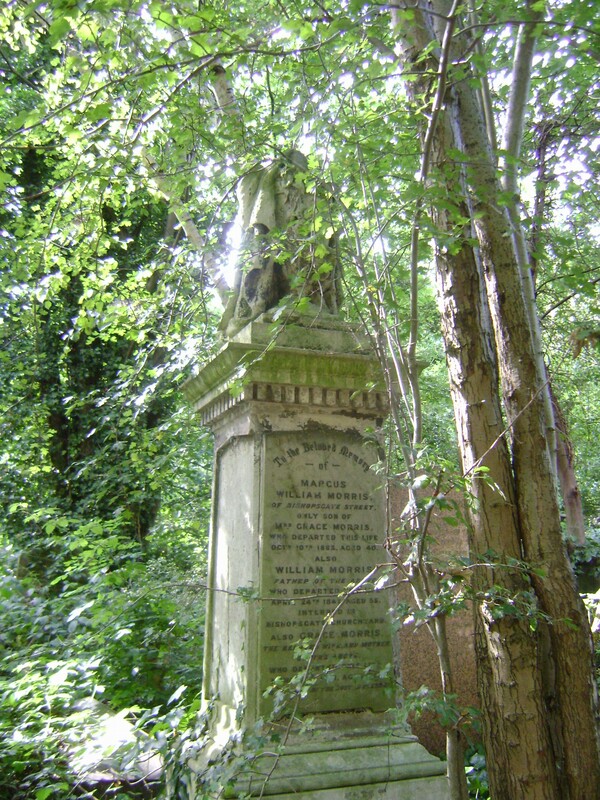 Whitfield did not enjoy his life as a carpet dealer for very long as in December 1844 he died and was buried at Abney Park Cemetery. He left all his “household goods, ffixtures, plate, linen, china and all and every my personal estate of whatsoever nature” to his wife Elizabeth whom he also named as the sole executor. (4) As he did not specify any of his goods, we are none the wiser, but as he does not mention a lease or freehold, we can probably assume that he just rented his property. Elizabeth continued the warehouse for a little while as she is mentioned in an Old Bailey case of October 1845 as the proprietor of number 38. (5) She is still listed in the 1848 Post Office Directory, but she must have given up soon afterwards as Edmund Weaver is listed as carpet manufacturer at number 38 in the 1851 Post Office Directory. As no examples of the carpets Whitfield sold, nor any advertisements listing his wares, have turned up, I have simply done a Google Image search for nineteenth-century carpets, so the carpets you see dotted around this post are the result of that search. Nothing to do with Whitfield; they just add a bit of colour to the page. (1) The London Gazette, 9 April 1841, 13 December 1842 and 13 January 1843. (2) The Morning Chronicle, 4, 5 and 8 September 1843. (3) Old Bailey case t18490409-1005. You can read the complete proceedings here. (5) Old Bailey case t18451027-2014. The story of the Sykes family is a complicated one, not in the least because the generations seem to have favoured the same names for their sons: Richard, John and William were by far the most popular, but for this post I will just concentrate on one William. The end of the partnership did not mean the end of the carrier service to Bury and Norwich as regular advertisements in The Bury & Norwich Post & East Anglian testify. The one on the left is from 25 April 1838. The 1841 census only shows a watchman, one Henry Tyler, at what is described as “Sykes yards”, but no mention is made of any servants which one would assume to be living there if Sykes had had a working inn. 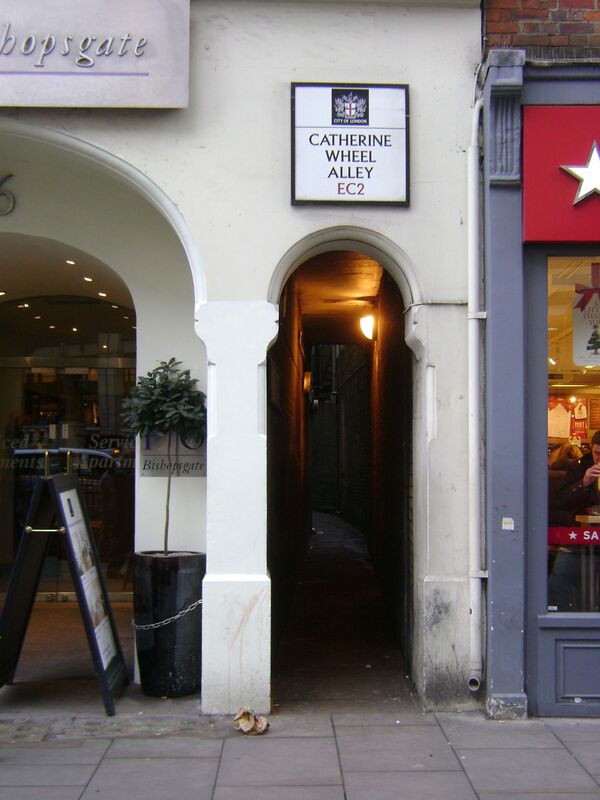 A William Sykes, but that may very well have been his uncle, with his wife Lucy and their children Joseph and Hannah, lived across the street in Catherine Wheel Alley. Where William the carrier lived, remains uncertain. To complicate matters, the Land Tax records for Bishopsgate Without show William Sykes as the one paying the tax for the “house & stabling” across the street, that is for the Old Catherine Wheel Inn, suggesting that the William at the New Catherine Wheel must just have rented the yard and office at number 188-190 as his name does not appear in the Land Tax records. 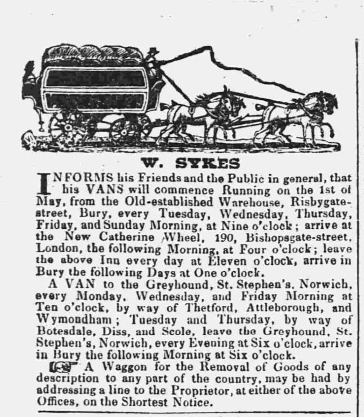 The only indication in the tax records that he was there is in 1844 when the entry is suddenly “late Sykes – waggon office”. 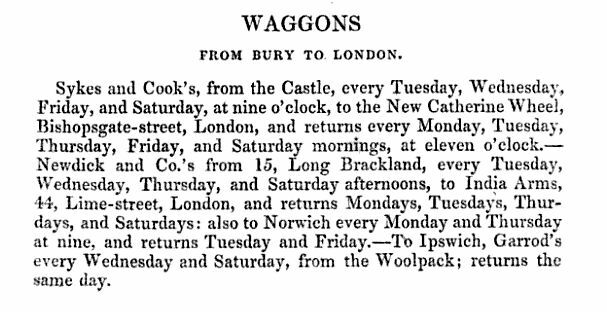 This accords well with an advertisement in the The Bury & Norwich Post & East Anglian of 14 February 1844 by E. Salter & Co. who announce that they have taken over the New Catherine Wheel Waggon Office for their luggage service. For the transport itself, they will be using the Eastern Counties’ railway between Colchester and Bishopsgate. 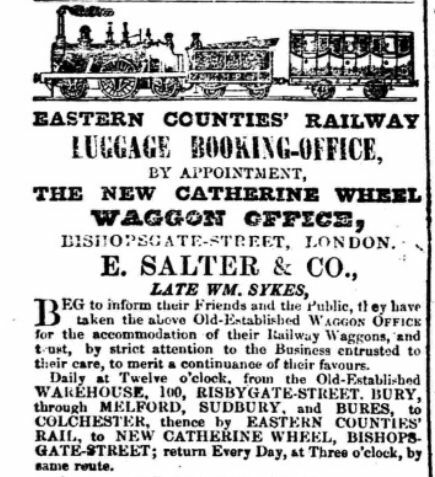 Their advertisement appropriately shows a train rather than Sykes’ old-fashioned waggon. So, William Sykes the carrier must have died before February 1844, but I have – so far – not found any reference to his burial or a will, so this is where the story for William will have to end, but not for the carrier office. 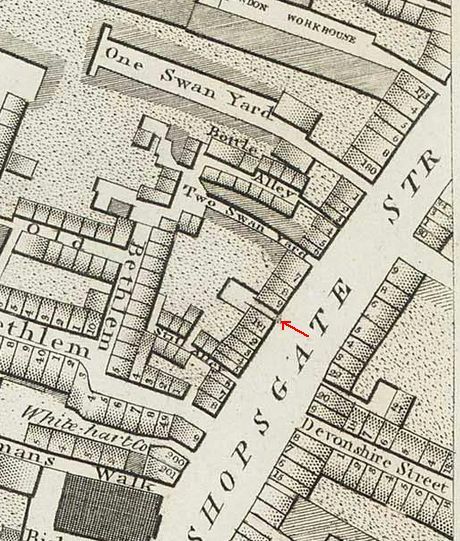 The 1839 Pigot’s Directory already gives E. Salter as carrier to and from Chelmsford, although at that time not yet to the Catherine Wheel, but to the White Swan in Whitechapel. And White’s History, Gazetteer and Directory of Essex of 1848 gives an Ephraim Salter, omnibus proprietor, of Woodford, Essex, who provides the carrier service between Braintree and London. The directory says that Salter leaves from the Wool Pack in Braintree, but not where he is going to in London, so whether that was the New Catherine Wheel office is unclear. At some point in 1848, however, Salter was described in The London Gazette as “of Bishopsgate” and in partnership as carrier with Hillary John Banerman who went bankrupt, but what became of Salter after that is not entirely clear. There was an Ephraim Salter in Essex who ran an inn in the 1851 and 1861 censuses, and he may very well have been the carrier, judging by a notice in The London Gazette of 5 August 1853 stating that the partnership in the business of contractors, carriers, and stage carriage proprietors between Salter and one McNamara was dissolved. Salter is here described as of the Bald Face Stag public house, Buckhurst Hill, Chigwell, but whether he was one and the same as the New Catherine Wheel proprietor is a matter of conjecture. Sykes and Salter were, by the way, not the only ones using the New Catherine Wheel as their London destination. 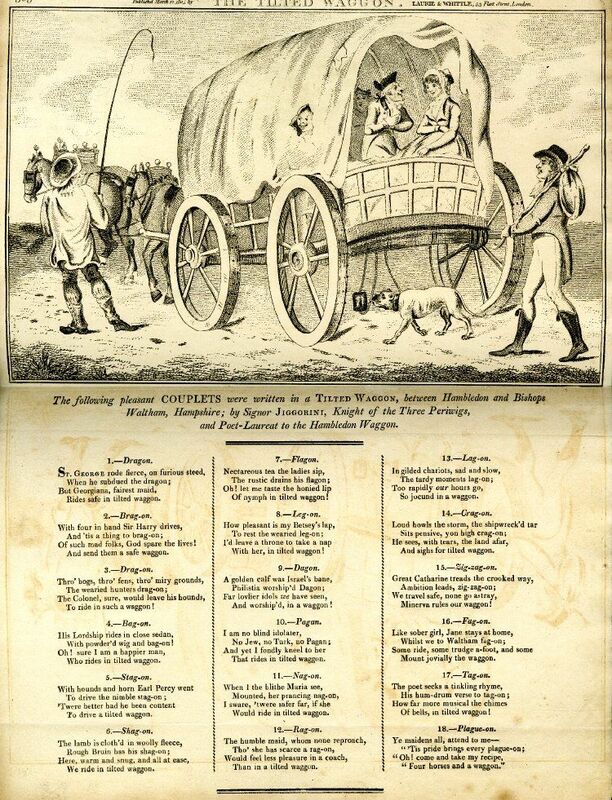 The 1839 Pigot’s Directory also lists one Elborne and E. Bullen for Royston in Hertfordshire; James Fisher for Hertford; T. Deacon for Hoddesdon; W. Biscoe for Buntingford (Herts); and William Low on Saturdays for Chelmsford, all travelling from the New Catherine Wheel. This is all I have been able to drag up for 189-190 Bishopsgate Without, so this is where the story for this address stops. (1) White Row Chapel, Spitalfields, 27 June 1799. His mother’s name is given as Ann and his father’s occupation as ‘innholder’. (2) The London Gazette, 3 December 1836. 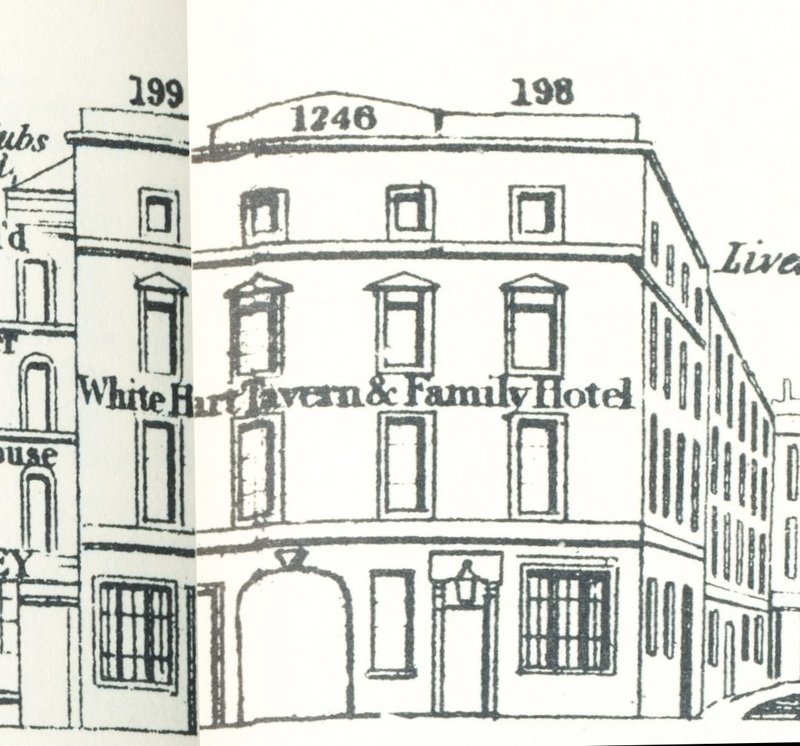 The elevation from Street View 67 above shows the White Hart Tavern & Family Hotel. The proprietor, William Morris, took over from his predecessor, one William Melton somewhere between 1825 and 1829. Melton is still mentioned in Pigot’s Directory for 1825, but in 1829, the insurance at the Sun Fire Office names Morris as the proprietor. 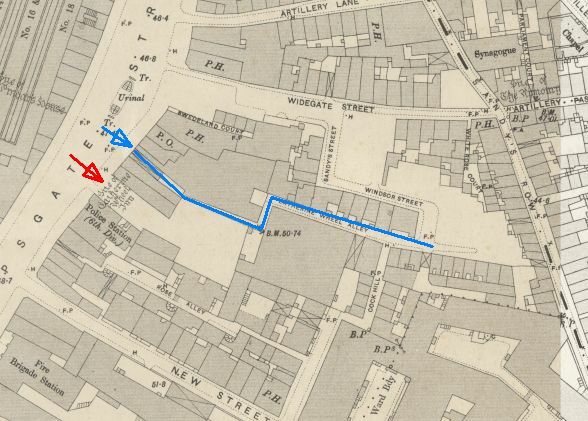 In 1819, the “tavern and coffee-house … together with the poulterer’s shop and liquor shop and tap” as well as “extensive premises at the back” and several houses in the neighbourhood were to be sold by auction by Mr. Burrell of 5, Throgmorton Steet at Garraway’s. (1) Whether that was the moment Melton acquired the property is unclear, nor is it clear whether he, and later Morris, acquired all the houses mentioned in the auction advertisement, or whether they were sold separately. 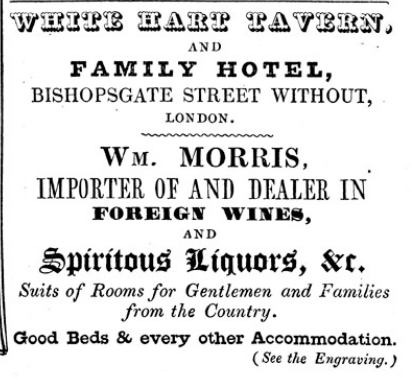 As the auction announcement tells us, the business was listed as a tavern and coffeehouse, but the advertisement in the Street View booklet informs us that Morris had expanded the business into a hotel and that he imported and traded “foreign wines, and spirituous liquors, &c.” He had rooms available for gentlemen and families from the country, not forgetting good beds and every other accommodation available, whatever that entailed. The inn was originally part of the buildings of the hospital of St. Mary of Bethlem, founded as a priory by Simon Fitz Mary in 1246. Fitz Mary owned considerable property in Bishopsgate which he gave to Godfrey, chaplain to Pope Innocent IV and bishop-elect of Bethlehem, who had come to England to appeal for funds to found a monastery. The charter of the order of “S. Mariae de Bethleem”, dated 1247, still exists. The brothers probably first lodged in Fitz Mary’s house while the priory was being built. In 1375, Edward III seized the monastic buildings on the pretext that it was an “alien priory” and the site lost its monastic character and became a hospital for ‘distracted’ people, hence Bedlam Hospital. (2) Fitz William’s house was turned into “a faire inne for receipt of travellours” who found the City’s Bishop’s gate closed after dark(3) It is unclear whether the priors themselves already ran the travellers’ inn, or that the building had been turned over to commercial proprietors. 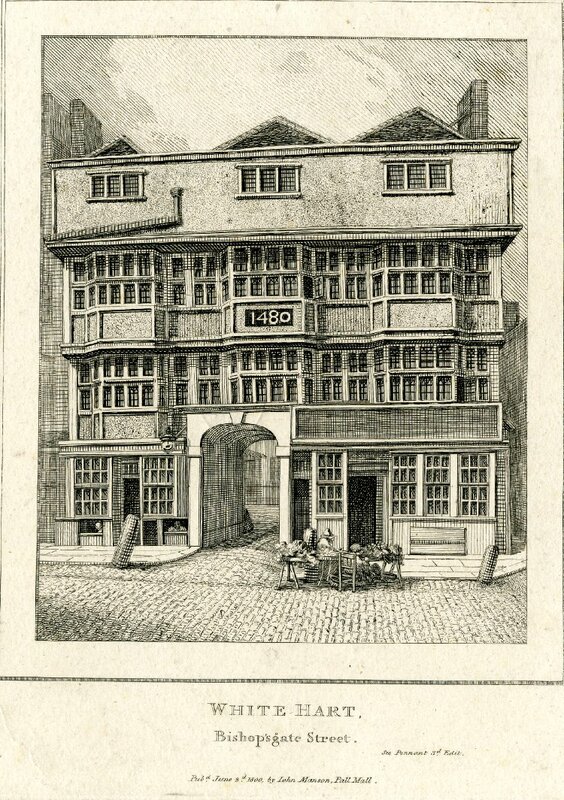 Until 1829, the building showed the year 1480 on its front, but it was certainly in use as an inn before that. Perhaps 1480 was the date a new building was erected on the site to replace the medieval house. 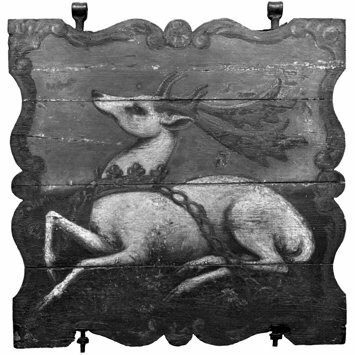 The story goes that the name The White Hart for the inn originated in the time of Richard II who used the symbol as his favourite badge and had his servant dressed in livery with an embroidered hart with a gold chain or collar. Hart, by the way, is not a spelling mistake for heart, but derives from Old English heorot, stag or deer. (4) In Dutch the word ‘hert’ is still used for a deer. The Mirror of 13 March, 1830 tells us that “during the past year (1829) the old building has been taken down, and on its site the inn has been rebuilt in a style of architectural elegance quite equal to the importance attached to taverns in our times: the new building forming the angle of Liverpool Street.” They do, however, show the old inn above their article. The building process of 1829 had not been quite as smooth as one might perhaps assume from the newspaper report. The Law Journal of 1832 reported on the case in the Court of Chancery of Lett versus Morris. 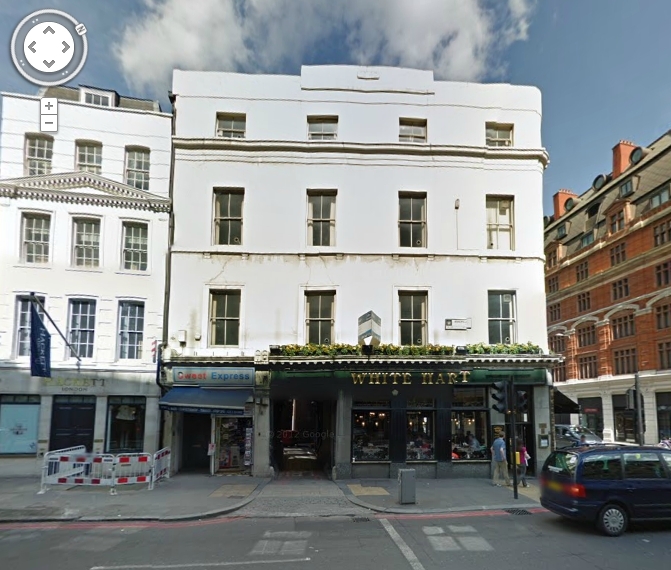 (5) It transpired that on the 4th of June, 1828, James Greenway, a builder, had agreed with Morris to pull down and rebuild the White Hart for 2,360l., the old material to be taken away for 160l. The money was to be paid in instalments according to the progress of the building work. Greenway ordered timber to the value of 700l. 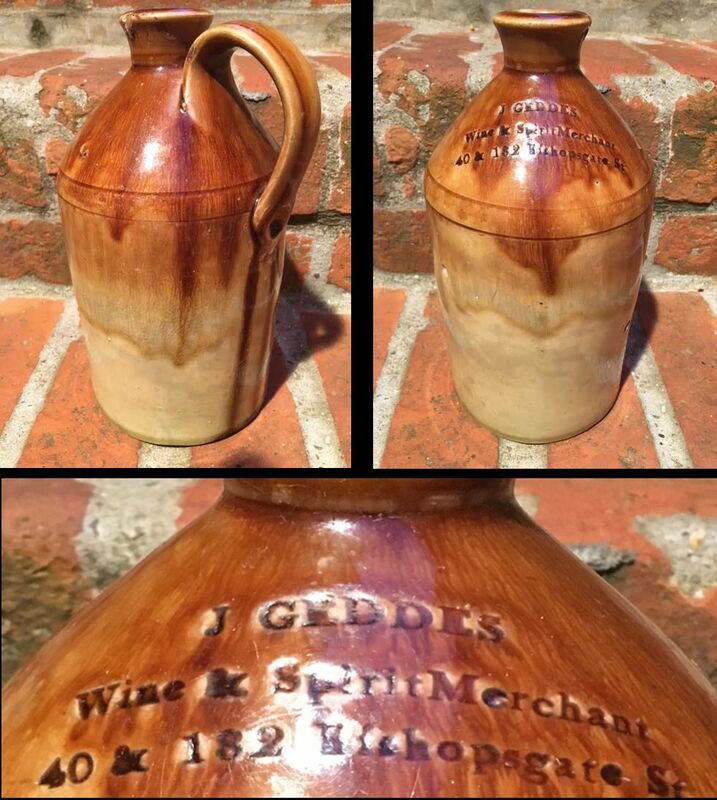 from timber merchant James Lett, but Lett would not supply it on the credit of Greenway (why not one wonders; was Greenway not very good in paying his suppliers?). Lett demanded a guarantee from Morris which he refused. 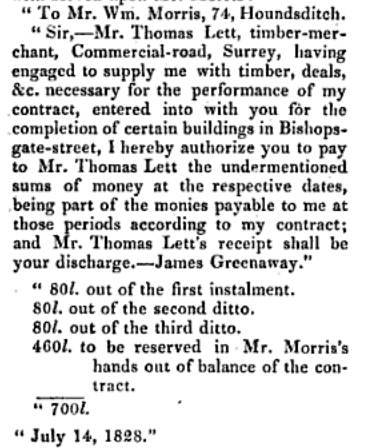 To get round this stalemate, an order was drawn up in which Greenway authorised Morris to pay parts of the instalment money due to him to Lett. Incidentally, this order also gives us Morris’s address at the time when his inn was being rebuilt. He was temporarily living at 74, Houndsditch. This money order satisfied Lett and he delivered the required timber. In September, he received his first instalment and later, the second instalment. However, Morris refused to pay the third instalment of 80l, or the remaining 460l. According to Morris, he had not paid Lett the first two instalments, but had handed them to Greenway, which was technically correct of course. He had paid those instalments because his surveyor had let him know that the building work was going as planned. But he claimed that after that time, “the contract had not been duly performed by Greenway in time” and that therefore the later instalments were not due. Unfortunately, poor Lett died before the case could be decided in court and his case was taken over by his executors. They argued that the order amounted to an equitable assignment, which the lawyers for Morris obviously denied. According to them an order, an authority to pay, is not the same as on obligation to pay. To cut a long legal story short, the court decided for the plaintiff and Morris was ordered to pay the balance of the account with costs. Unfortunately, the story does not tell us in which way Greenway was at fault, other than being a bit slower than agreed upon, but judging by the article in The Mirror, the building was long finished before the case came to Chancery and Lett seems to have been hard done by. After the death of William Morris (buried St. Botolph B’gate 30 April 1842), his widow Grace took over, later assisted by her son Marcus William and daughter Helen. Grace and Marcus were born in Mevagissy, Cornwall, but Helen in Middlesex. Whether William was also born in Cornwall is uncertain. 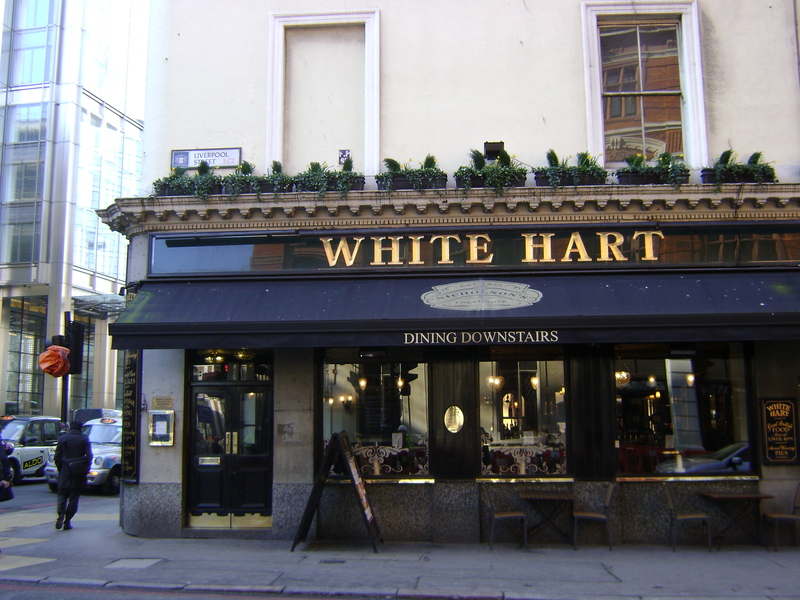 In the 1851 census, the White Hart spirit vaults are listed separately as occupied by James Clubb, the manager, and his family. A similar division is probably visible in the illustration in The Mirror where the left-hand side of the picture shows the name of Morey, but that is a mistake by the draughtsman as will be explained in the post on Morey. In the 1861 census, the vaults are no longer mentioned separately, nor is there any mention of a manager for them. The Morrises are assisted by an assistant, a waiter, a cook, a chambermaid, a porter, two barmen and a housemaid. Marcus died 10 October 1862 and his probate record gives his mother as his only next of kin. (6) Grace probably stopped running the tavern shortly after Marcus’s death as the Post Office Directory of 1869 lists a Henry Clifford Green as the proprietor. The pub still exists [or it did when I wrote this post, see here for developments (Dec. 2014)], albeit with the address now numbered 121 Bishopsgate, but you can certainly still recognise the Morris building. (1) Morning Chronicle, 5 Feb. 1819. (2) C.W.F. Goss, The White Hart, Bishopsgate, 1930. (3) John Stow, The Survey of London (1633), p. 172. (4) Oxford English Dictionary: Forms: OE heorut, heorot, OE–ME heort, ME–15 hert, ME–15 herte, ME–15 harte, ME– hart. (5) The Law Journal for the year 1832: Comprising Reports of Cases in the Courts of Chancery, King’s Bench, and Common Pleas, Exchequer of Pleas, and Exchequer Chamber, from Michaelmas Term 1831, to Trinity Term 1832, Volume 10 (1832), p. 17-18. (6) England & Wales, National Probate Calendar (Index of Wills and Administrations), 1858-1966: Probate granted 12 December, value under £2,000.